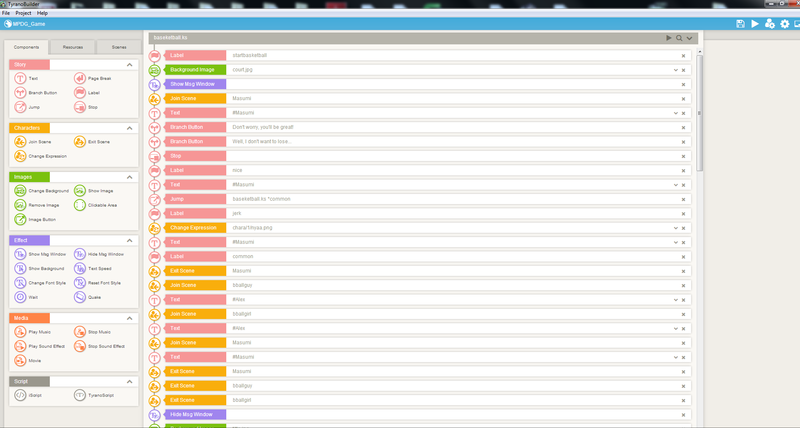 Today I thought it might be nice to show a bit of what the TyranoBuilder interface looks like. On the left hand side, you can see the menu of various actions you can select. And on the right hand side is the “flow” of actions that the game will execute, one after the next after the next. The difficult part about using this program is to think through how you will turn branching options and loops and variables into a string of linear steps. You can tell the computer to skip ahead steps or to back track and begin again from a previous step. But you have to think ahead about how you are going to do so, because if the steps get confused, the game, when tested, will just stop. In other words, if the game isn’t sure what the next step along the path is (or if it finds that step impossible to execute for some reason), then you will have a bug. My plan, ultimately, will be to release documents containing all of the info about how I build this game along with the game itself so that future designers can see how I solved certain problems (much like how I made the “back end” of my previous game, Night of the Living Memes, available for anyone who has the RPG Maker program). In the meantime, I’m plugging away on scene number 3 out of around 9 or 10!